Britt-Marie Was Here by Fredrik Backman was on my wish list for BEA 2016. I was delighted to receive a signed copy. When an opportunity to review the audio came along, and I heard the delightful voice of Joan Walker I decided to listen first. I am so grateful that I did. Britt-Marie Was Here is going on my top ten audio listens for 2016. 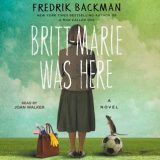 Brilliant, heart-warming, funny, and poignant, Fredrik Backman shows that anyone can change, even a stubborn, set in her ways young woman like sixty-three year old Britt-Marie.